THIS WEEK’S OTHER FEATURED BOOKS, “WAITING TO BEGIN,” BY PATRICIA O’DONNELL AND “THE PORTLAND HOUSE,” BY JIM LANDWEHR, CAN BE FOUND BY SCROLLING DOWN BELOW THIS POST, OR BY CLICKING THE AUTHOR’S NAME ON OUR AUTHORS PAGE. 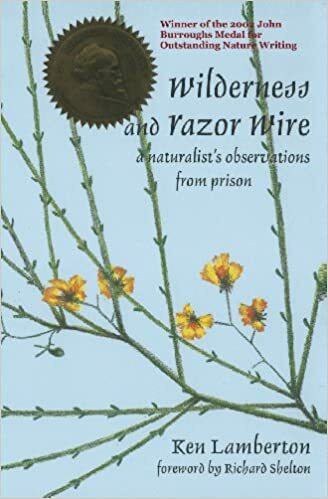 THE BOOK: Wilderness and Razor Wire: A Naturalist’s Observations from Prison. THE EDITOR: Foreword by Richard Shelton. THE PUBLISHER: Mercury House, San Francisco. SUMMARY: Serving time in an Arizona state prison, I write about my crime, the effects of my incarceration on my wife and children, and the ways in which my observations of and reflections about the world of nature helped heal and instruct me, as well as pass the time. In a place where boredom can be refined to a new level, I write about insects and birds and weeds that trespass the prison yard or I can observe beyond the wire. THE BACK STORY: Wilderness and Razor Wire grew out of a collection of essays I had been publishing in literary journals for almost a decade under the mentorship of Richard Shelton, who was leading the creative writing workshops in prison. WHY THIS TITLE? I wanted the title to reflect that wilderness and nature can be found in the most unlikely places, even a prison. WHY WOULD SOMEONE WANT TO READ IT? This is the first book of its kind, not just a book of literary nature writing, which has a huge genre, and not just a book about prison. Wilderness and Razor Wire is both. The book is intended for people interested in nature writing and people interested in prison writing. It won the John Burroughs Medal for outstanding nature writing, putting the book into the same class as those by Rachael Carson, John McPhee, and David Quammen. “Ken Lamberton would like you to believe his book, Wilderness and Razor Wire, is about the smell of creosote and rain on the wind, about hawkmoths dipping from the wells of cactus. Don’t believe him. “Don’t be misled by the drawings of brittlebush and silverleaf oak (all done by Lamberton himself), or the well-intentioned, avuncular foreword by Richard Shelton, who taught Lamberton writing in prison workshops and at the University of Arizona. Though the nature writing here may be some of the best to come our way in a generation, this is not first and foremost a book about poppies and peppergrass. It is about the soul in pain. Reading it is like chatting with someone on the street and suddenly noticing there is blood running down his side. “All of which is to say that Lamberton (for the past 12 years an inmate of Tucson’s Santa Rita Prison) has written something entirely original: an edgy, ferocious, subtly complex collection of essays on the nature of freedom and the freedom of nature, whose true subject, and greatest accomplishment, may be its own narrative voice.” — Mark Slouka, San Francisco Chronicle. “Short, unbuffed essays that shuttle restlessly between natural history and prison life, and the unexpected moments of interpenetration…. These are quick essays, for the encounters are perforce brief and circumscribed: on the seasonal migration of birds through the yard, where they would overnight in the few spare trees that existed before prison officials cut down as being too civilized for inmates; on a tarantula hawk shadowing its prey; or on the spider itself, its fangs piercing the armor of a beetle “with a primeval sound, a sound out of the Devonian.” The writing is stony and unmediated with humor, though warmed by Lambertons remorse, and cautionary; unless you’ve been there, you can’t begin to imagine how bad prison life is, even in medium security. “I’d rather watch bugs,” says Lamberton of all prison amusements, for the moths and bees and jimsonweed are his communicants, if not his salvation. AUTHOR PROFILE: I moved to Tucson, Arizona, at the age of nine when I slowly and painfully learned to become a child of the desert, taking my first lessons in the front range of the Santa Catalina Mountains. I eventually graduated from the University of Arizona with a bachelor’s degree in biology. While serving a 12-year sentence in prison, I joined the creative writing workshop of poet and author Richard Shelton and soon began publishing articles and essays about the natural history of the Southwest. In January 2000, Mercury House published my first book, Wilderness and Razor Wire, to critical acclaim. The San Francisco Chronicle called it, “…entirely original: an edgy, ferocious, subtly complex collection of essays…”. The book won the 2002 John Burroughs Medal for outstanding nature writing. After leaving prison, I completed my MFA in creative writing at the University of Arizona and continued writing and publishing essays and books about the Southwest. In 2015, The University of Arizona Press published my sixth book, Chasing Arizona, which deals my travels to 52 destinations in 52 weeks, experiencing the people, places, and treasures that make our state great. Today, I live with my wife in an 1890s stone cottage near Bisbee, Arizona. AUTHOR COMMENTS: A key theme of the book is the fascination that people have for nature, what E.O. Wilson called “biophilia,” that humans have an innate affinity for wildness. This includes people locked up in prison. From swallows nesting in our cells and our protective interest in the birds, including missing their absence when they migrate south for the winter, to standing transfixed when a hawk captures a raven outside the fence and perches on a nearby tree to eat it—we are all connected to wilderness. All you have to do is notice it. I look forward to your post on my short story collection, Get Back.